The scale means sequence of sounds. The structure of the sounds are like a ladder. These sounds can be arranged in ascending and descending order. The first and last note is the same but the last note will be in next octave. (an octave means 8 keys higher. E.g. C to C, D to D). There are many scales in music. Major scale, Minor scales, pentatonic scales, chromatic scales and so on. Every scale has their own identity the expression and feelings are different. I would like to explain the major scales. It is one of the best and basic scales in Western music. 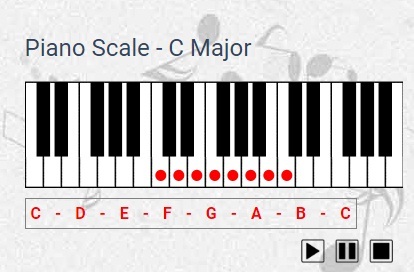 The sounds are C, D, E, F, G, A, B, C these are the major scales. The structure of the keys- there is no other keys in between 3rd and 4th, 7th and 8th keys. There will be other keys (half step) in all remaining keys. E.g. C key, D key, E No key, F key, G key, A key, B No key C...All other major scale structure is like this way. I noticed that; there is some similarities in other music. 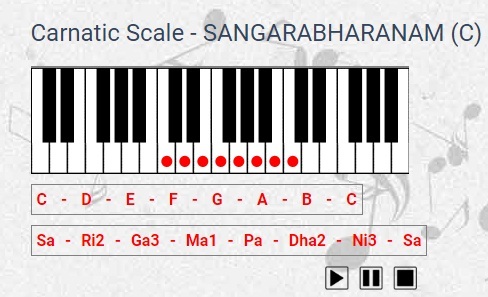 Sangara Bharanam (Dheera SangaraBharanam) is the similar Raga with major scales. The Carnatic Musicians are singing SA RI Ga Ma Pa Dha Ni SA. That means C D E F G A B C. The sounds are same but the singing style is different. If there is more similarities with three Ragas or scale (Major scale, SangaraBharanam, Bilawal Raga) All Ragas expression, dynamics are different.